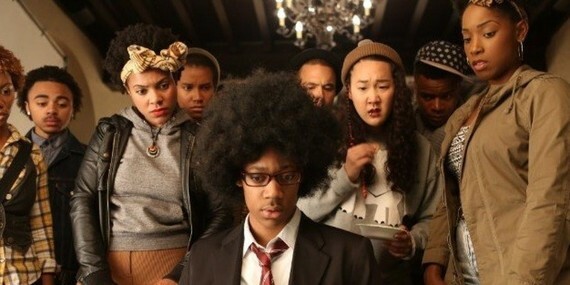 Dear White People reminded me that race is too often framed as a dichotomous conversation of black vs. white. It's not. Taking place on an Ivy League campus (where Asian Americans are commonly enrolled in high numbers), there was only one Asian-American student seen on screen -- named Sungmi -- playing the role of the token Asian hanging out with predominantly black students. 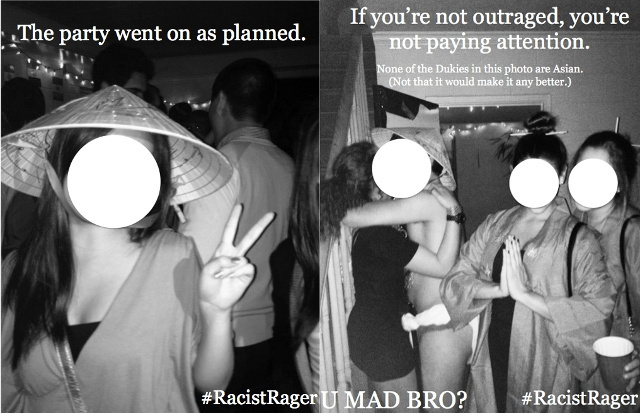 When the film culminates in the racist incident of the campus blackface party, I watched in solidarity while reflecting on similar racist events where students threw "Asian-themed" parties and dressed up in Asian stereotypes, such as this frat party at Duke University in 2013. It was absolutely enraging; together, black and Asian-American communities could align on the side of anti-racism. 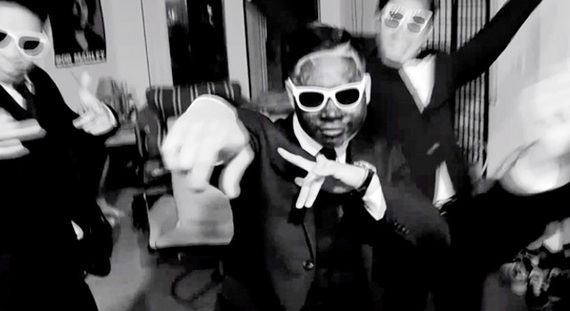 That same year, an Asian-American fraternity at UC Irvine released a video with an Asian-American student performing in blackface. Whether these students were aware of it or not, their actions made it clear that they were aligning on the side of anti-blackness. These two examples alone illustrate the fluid positioning of Asian Americans in the racial dialogue. As a marginalized community of color, Asian Americans can stand against racist systems that condone anti-blackness. As a community of color with lighter shades of skin color and framed within the "model minority" myth, Asian Americans can be complicit in anti-blackness and collaborate in the perpetuation of systemized racism. Perceptions of race are constantly changing, since race is not biological. Rather, it's a social construct created to establish systems of oppression based on the appearance of skin color -- with whiteness being endowed with the most power and privilege. Thus, Asian Americans with lighter skin share privileges in a system that benefits whiteness. Asian Americans with darker skin (primarily Southeast Asian and Pacific Islanders) still face discrimination based on skin color and appearance. At the same time, Asian Americans share a history of oppression with other marginalized communities of color -- including deportation, Japanese internment camps, hate crimes (e.g., Vincent Chin) and police brutality (e.g., Fong Lee). The "model minority" myth was created to pit Asian Americans against other communities of color, in an effort to derail solidarity and support a racist agenda. While some members of the widely diverse Asian-American community have been able to climb social and economic ranks through several generations of assimilation, many others are recent immigrants or first-generation citizens still struggling to navigate the American system. All this is to say that Asian Americans have a critical role in shaping the future of race in America. In a country where Irish and Jewish people were once considered non-white but later gained admission into whiteness, Asian Americans can perhaps gain a similar form of admission -- but only at the cost of anti-blackness. In Dear White People, the Asian-American character, Sungmi, clearly aligned on the side of black students -- but real solidarity isn't as superficial as joining the black student organization and reading up on black culture (in the film, she reads Ebony/Ivory Magazine). Asian Americans don't have to reject their racial and collective identity in order to show solidarity against anti-blackness. Racial progress begins with each individual -- to self-reflect and become self-aware about the individual's own race, positioning in society and social responsibility. From there, people have to make a decision about how they will participate and contribute to the future of racial progress. For Asian Americans, being unconscious of their role in America's system -- in acknowledging both the privileges and the oppressions -- only makes them complicit in racism. Change is an act of commitment. For racial progress to happen, it's necessary for everyone to determine if they will align on the side that perpetuates anti-blackness or align on the side that works towards racial justice for all.